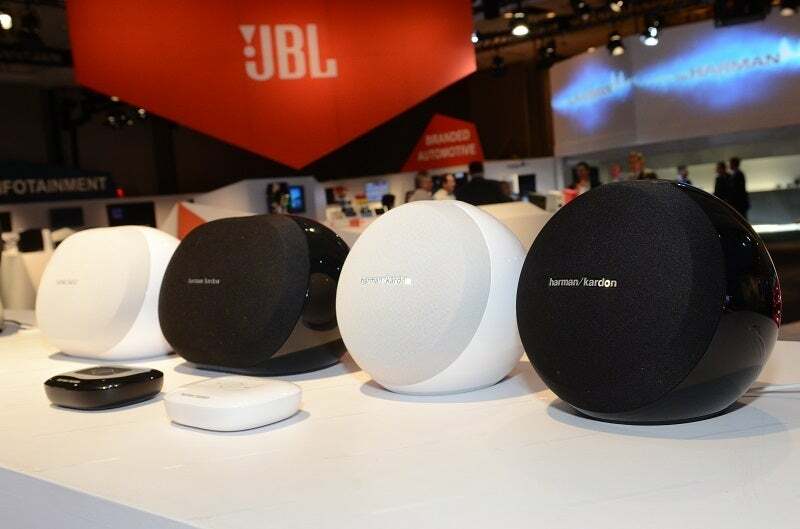 Harman had a big presence at CES, as it always does considering its portfolio includes AKG, Harman Kardon, Infinity, JBL, and several other well-known brands. Some of the most interesting new products at its booth this year were gesture-controlled headphones, active noise-cancelling earbuds, and an update to its Harman Kardon Wireless HD Audio System. Harman Kardon Wireless HD Audio System: Harman describes its multi-room audio system as “HD” because it’s capable of wirelessly streaming music encoded with up to 24 bits of resolution at sampling rates as high as 96kHz. 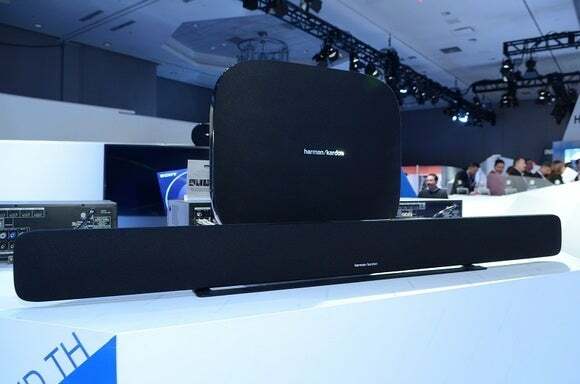 Harman added the Omni Bar—a home-theater soundbar with a wireless subwoofer—to its Wireless HD system at CES. The soundbar joins the existing Omni 10 and Omni 20 loudspeakers. Using the Harman Kardon Controller app (Android and iOS), you can pick and choose which speakers you want to play your music on. You can have all of the speakers play the same music, or you can pick different tunes for each room. You can pair two Omni speakers in the same room to produce stereo, but the system is limited to six speakers in total. Each Omni speaker has a “Follow Me” feature—a single button that you can press to have your music “follow” you around the house. For example, if you start listening to music in the living room, you can walk into the kitchen and tap your kitchen speaker’s LINK button and your music will start playing on your kitchen speaker (and will stop playing on your living room speakers). The Omni 10 and Omni 20 are available now for $199.95 and $299.95 respectively. The Omni Bar will be available in April 2015 for a suggested retail price of $799.95. 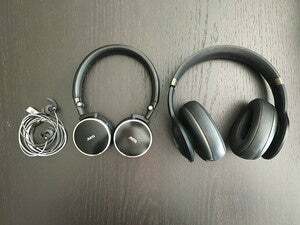 JBL Reflect Response BT and JBL Synchros S210 BT: In-line controls on headphone cables are a pain. They’re hard to use, especially when you’re in the middle of something, and easy to break (trust me). 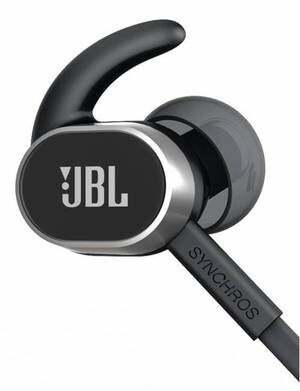 JBL’s new Reflect Response BT and Synchros S210 BT headphones just might have the solution: Gesture control. Instead of using a clumsy remote to switch your music, turn up the volume, or take a phone call, you simply wave your hand near your ear. The gestures are somewhat intuitive. Wave your hand forward to skip a track, for instance, and wave your hand backward to go back a track. You can also turn the gesture controls off, in the event that you’re in a crowded area or people are constantly putting their hands near your ears. The Reflect Response BT and the Synchros S210 BT cost $149.95 and $199.95 respectively. JBL Reflect Aware: Jogging on a busy street while wearing earbuds is dangerous, because you can’t ambient noise—such as the car with a distracted driver who’s about to run you over. In most other situations, however, you don’t want any ambient noise at all to seep in a spoil the music. JBL’s Reflect Aware sport earbuds promise to solve this conundrum with “Ambient Aware” technology that allows you to mix active noise cancelling with the ambient sounds of your environment. When you want to increase your situational awareness—while jogging, for example—you can increase the amount of ambient noise that leaks into the headphones, so you can hear the cars on the street. When you’re in situations where you want to concentrate on the music, you can reduce ambient noise with active noise cancelation. Unlike other earbuds that offer active noise cancellation, the JBL Reflect Aware don’t need batteries, but you’ll need an iOS device to take advantage of this: They draw power from the Lightning port on an iPhone or iPod. 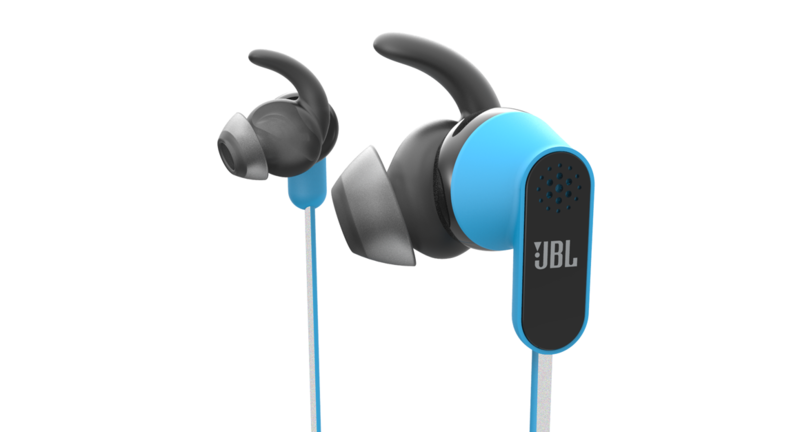 The JBL Reflect Aware are priced at $149.